Melamine is a chemical used for making amino resins, plastics, adhesives, and pesticides. Melamine can be found in small amounts in food or drinks which have been stored in a plastic container. Animals may eat feed or grass which has been sprayed with melamine-based pesticides and consume small amounts, which can then be found in their meat or by-products (such as pork, beef, sheep, and poultry, as well as eggs and fish). 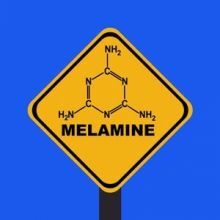 In the levels normally found in foods, melamine is not toxic and is not linked to the severe kidney toxicity seen with the recent powdered milk contamination in China. Even at these very high levels, melamine must also be ingested over a long period of time to cause this kidney toxicity. For example, a child given a one-off bottle containing contaminated milk formula, would not be at risk of toxicity. Is There a Safe Level of Melamine? The World Health Organization (WHO) has set a Tolerable Daily Intake (TDI) of melamine at 0.2 mg per kg body weight per day, which is approximately 29 times the average daily intake of 0.007 mg melamine per kg of body weight. The WHO has also set an Acceptable Level in Food at 1 part per million (ppm; 1 mg/kg) for infant formula, and 2.5 ppm (2.5 mg/kg) for other foods. Based on these values, this means a 6 kg infant would need to ingest 1.2 kg of infant formula (containing the maximum allowable level of melamine) every day to reach the TDI, and an adult much more than this. Long-term, high-level, melamine ingestion can cause small stones to be formed in the kidneys. Symptoms reported in infants include unexplained crying (especially while urinating), vomiting, blood in the urine, urinating frequently or not at all, stones discharged in the urine, swelling, back pain or tenderness in kidney area, and urinary tract infection. In severe cases these stones can cause kidney failure and in some cases have been fatal. What Do I Do if I Think a Food Product is Contaminated With Melamine? You should contact your local food safety or public health authority. In New Zealand, you should contact the New Zealand Food Safety Authority on 0800 693 721. What Should I Do if I Think Someone Has Been Poisoned By Melamine? You should contact your local poisons information centre or doctor. In New Zealand you can call the National Poisons Centre on 0800 764 766 (0800 POISON) 24 hours, 365 days a year. Depending on the source of poisoning, an appropriate local authority should also be contacted (food safety, public health, or police).